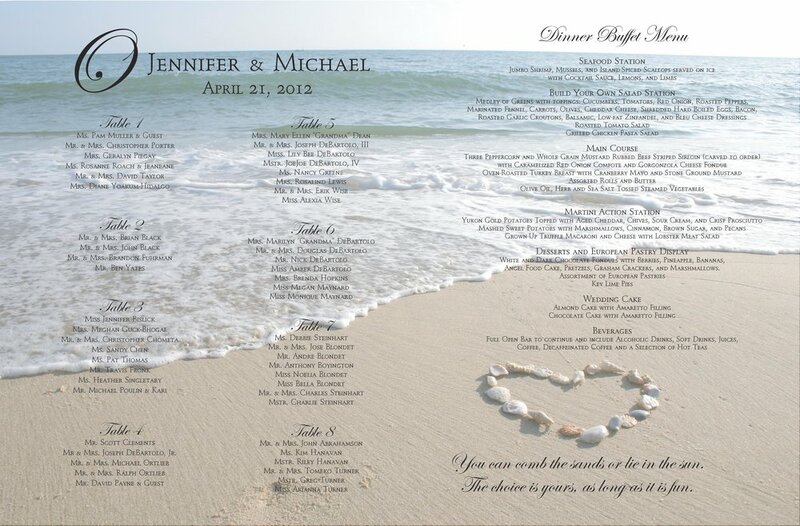 Should I have Seating Arrangement at the Reception? The choice to assign seats at your wedding reception or not can seem to be a difficult one, however . . . Unless you have less than 30 or so guests, it is recommended that you assign your guests to a certain table. Otherwise, you may have families who can’t find seats together. There’s one seat open at table 9 and two seats open at table 3, or people start moving chairs around to be with friends and all of a sudden you’ve got one table with 14 squished people and one table with 4 lonely people. Do the table seating! It makes for a much more comfortable environment for both the couple and the guests. After dinner, people can move around and sit with whomever they want. Some people leave relatively early and it opens up the tables anyway. Seat family up front together so they can talk and be near the bride and groom and don’t feel as though you must force the families to get to know each other at your wedding by seating half bride and half groom at each table as old etiquette recommends. The Difference on how they can be used. The choice comes down to whether or not you have a meal choice for your guests or not. 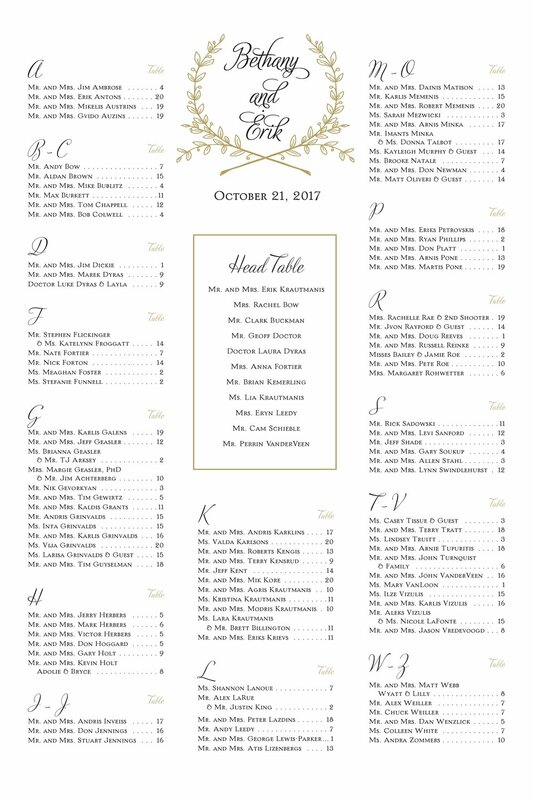 If you are having your guests select their meal choice on the RSVP card then you’ll likely need place cards. If it’s buffet, family style or combo plate then just a poster is perfect. 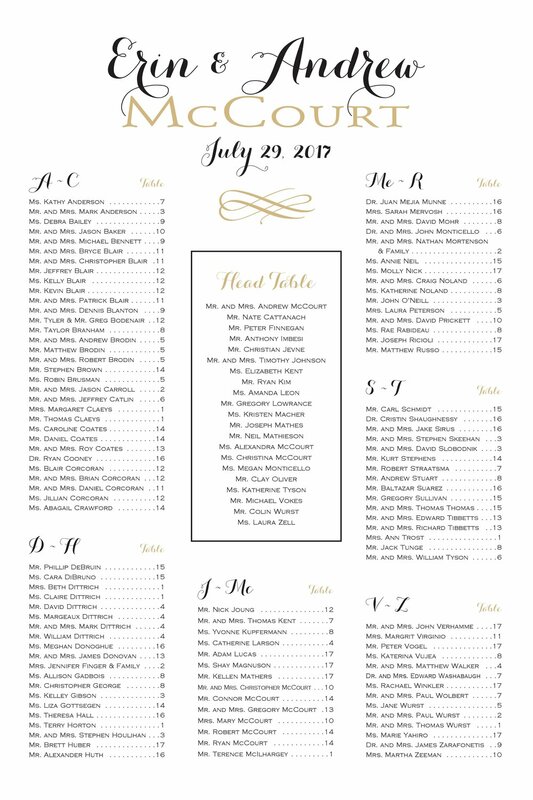 Place cards can be ordered with guests name, table assignment and meal selection (if applicable) printed on for a nominal flat fee (in addition to the actual cost of the printed place cards). That service is called Variable Data Printing and it saves time but must be ordered at least 2 weeks prior to the wedding, 3 weeks or more is preferred. 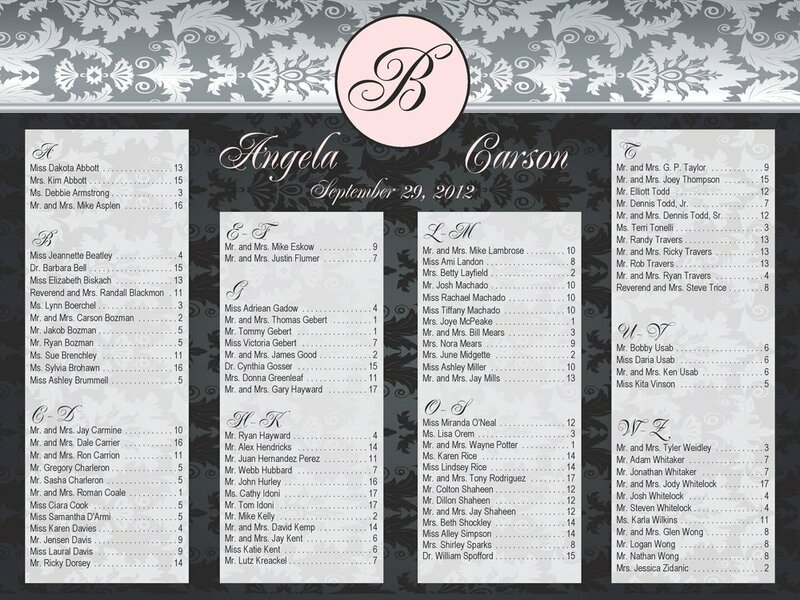 Using place cards or a seating chart poster will allow your guests to select their own seat at their assigned table. You can use both place cards and poster both by having the place cards already setup at the table, this option doesn’t allow your guests to select which seat, you select it for them. Download the Order Form/Contract in Word or PDF to review all the ordering details & pricing information or to get started with an order. Download the Excel file to input all your guest information. Turn-around time for posters: Completed Order Form/Contract, completed Exel spreadsheet due no later than 8 working days prior to the date you need the poster in your hands – this is if you are picking the poster up. If you need the poster shipped then the deadline is no later than 12 working days. A proof will be provided and you can still make changes up until the time the proof is approved. Rush Fee of $25 may apply if all items are received after the due date.